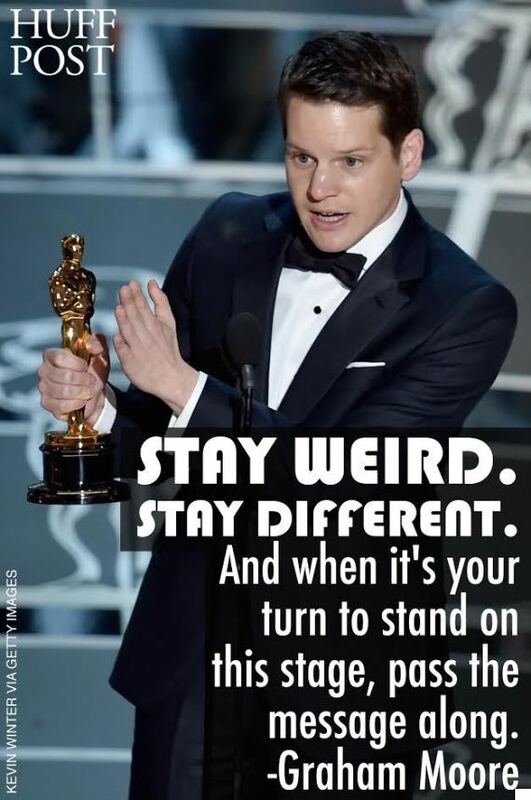 Last night at the Oscars your son, Graham Moore gave inspiration and hope not only to every adolescent that feels “weird and different” but to all the parents working desperately everyday to raise these children and to convey to them that “weird and different” is the stuff of greatness. I know firsthand how hard it is to raise a child that does not fit into that proverbial box. I know how many days and nights you stayed awake praying that he would find solace in being himself. I know the pain and suffering that you endured when he believed at the core of his being that his life was not worth living. And last night, when your son stood up in front of an audience of several hundred million people (at a time that he could have promoted himself) and spoke so honestly, he gave me and millions of other mothers around the world hope that our own sons may one day believe that they too matter in this world. I have no dreams of having a son win an Oscar. But I dream of having a self-actualized child who is comfortable being himself and confident enough to share this message with others. Ms. Sher, I hope you are floating today. You deserve it. You raised a boy that took the stage last night and gave all of us the courage and the faith to know that as hard as this moment may be, it will not last forever and it may lead to something great.